Bake Me a Wish, online at bakemeawish.com, is an online service for cake and other baked good deliveries. Bake Me a Wish allows customers to send their loved ones a special gourmet treat for a variety of occasions. Among the occasions that customers can select from you will find birthdays, anniversaries, congratulations, thank you, sympathy, get well soon, thinking of you, I'm sorry, and many others. Bake Me A Wish doesn't just offer cakes they also carry a selection of baked goods including cookies, brownies, and bars or even send a delicious gourmet fruit basket. So when you want to send that special someone a delicious cake or gourmet good then be sure to checkout the variety of delivery options that Bake Me a Wish has for you. But first, stop by RetailSteal to find the best Bake Me a Wish coupon codes, Bake Me a Wish promotions, and Bake Me A Wish discounts. Bake Me A Wish offers standard ground delivery via UPS. Expedited shipping options are available at an additional fee. See website for full details, exclusions may apply. Enjoy a 20% discount on your purchase at Bake Me a Wish when you use this coupon code at checkout. Click to save. Enjoy 15% savings on birthday cakes and bakery gifts from Bake Me a Wish when you use this coupon code online. Click to save today. Enjoy a 14% discount on any order at Bake Me A Wish. Use coupon code to save. Use this coupon code on Bake Me A Wish to save 10% on any order. Click to save. Enjoy 5% savings on any cake from Bake Me a Wish when you enter this coupon code at checkout. Click to save. 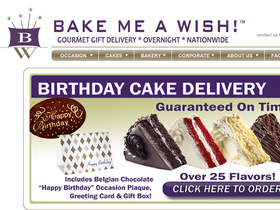 Save $4 on your order at Bake Me a Wish when you use this coupon code on orders $40+. Order 2 or more cakes from Bake Me a Wish and save 10% on your entire order. Click to save. Select from over 25 delicious cake flavors from Bake Me a Wish to send to that special someone in your life.